The website, which falls under the umbrella of Beyond Type 1 programs, will include resources with practical information, coping tools and emotional support. Lucas explains the site will address the difficult topics such as how to plan a funeral, how to deal with unexpected financial expenses, how to get through the holidays and even how to cope with putting a loved one’s belongings away. The program, according to Lucas, will serve a group of people who are often “invisible or sometimes forgotten in the broader Type 1 diabetes community,” she says. The program is inspired by Michelle Page-Alswager’s experience after the sudden loss of her son Jesse, who was 13 when he lost his battle with Type 1 diabetes. She remembers wondering who would want to “hang out with the mom who lost her kid.” But Page-Alswager turned her fear around. A few days after her son’s funeral, one of Jesse’s teachers sent Page-Alswager an essay he had written. 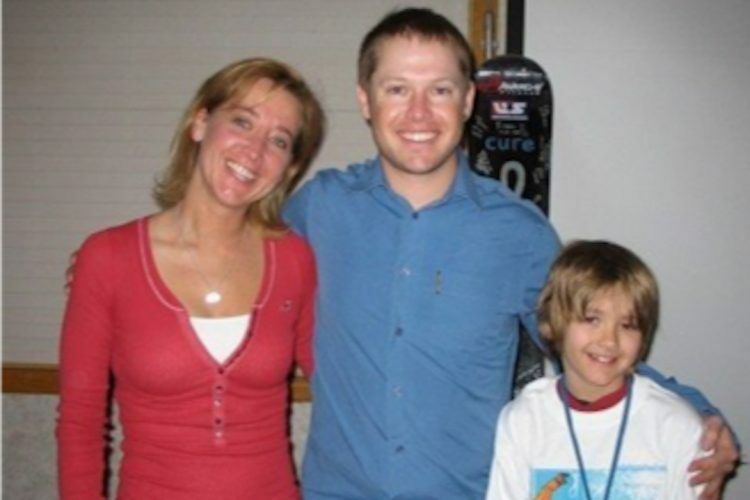 Michelle and her son, Jesse, with longtime friend and professional snowboarder, Sean Busby, at one of the first Riding On Insulin ski/snowboard camps. Her son’s open essay, in his own handwriting, was entitled “My Mom is Courageous” and went on to describe, in detail, everything his mom ever did for his diabetes. While grieving the loss of her son, and the potential loss of the diabetes community, Page-Alswager decided to create an online community to support parents who had also lost their children to Type 1 diabetes. She mentored families and created a community of people going through similar losses. With the site’s Tribute page, people will be able to create beautiful, online memorials where they can share photos and post stories about their loved ones. The greatest goal for the Jesse Was Here program is to give people a sense of belonging and community as they grieve. “It will give people hope that they are not going to be in the darkest of darks for the rest of their life and that they can find joy,” Page-Alswager says. She has seen the benefit of what a small group did for her, and her goal is to bring this to essentially the world by extending the reach to the global community. There’s such a great need that’s not being met, and that is her vision as well.